Located right on the waterfront, Grand Hyatt Playa del Carmen Resort is a short 45-minute drive to Cancun International Airport. The flourishes of acclaimed Mexican architect Sordo Madelano are plain to see at Grand Hyatt Playa del Carmen Resort. Natural elements are plentiful, while unique artworks, bright textures and natural light all form the hallmarks of the 314 rooms and suites. Unique food and beverage options await visitors here, with a number of delights located along the Paseo. Fresh seafood and steak can be sampled at The Grill at 1-26, local delights are on offer at La Cocina, while an elegant evening can be spent at El Paseo with its refined menu and culinary delights. Three bars and lounges also cater to those looking to get the party started. 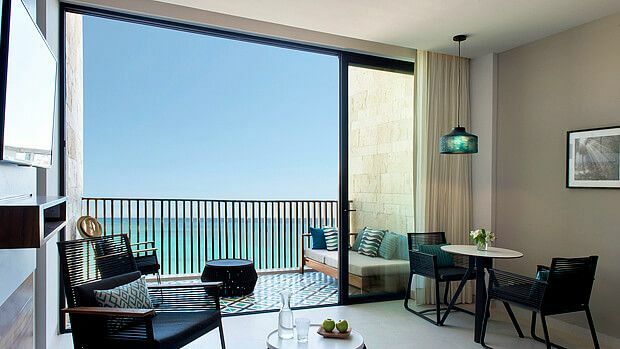 Given it's location in such balmy climes, Grand Hyatt Playa del Carmen Resort provides a plethora of outdoor pursuits for guests to spend time with. The hotel sits on a 150-meter stretch of pristine beachfront, granting easy access to white sands, watersports, as well as the hip local beach clubs and lounges. A fitness center and lap pool also delivers recreational activities a little closer to home. Send an availability request with your requested dates to the Grand Hyatt Playa del Carmen Resort. Features a King bed, large balcony, floor-to-ceiling windows, rain shower and a garden view. Features two Queen beds, large balcony, floor-to-ceiling windows, rain shower and a garden view. Features a King bed, garden view, floor-to-ceiling windows, rain shower and balcony with small plunge pool. Features two Queen beds, a garden view, floor-to-ceiling windows, rain shower and balcony with small plunge pool. Features a King bed, partial ocean view, floor-to-ceiling windows, rain shower and furnished balcony. Features two Queen beds, partial ocean views, a rain shower, floor-to-ceiling windows and a furnished balcony. Features a King bed, swim-up pool, floor-to-ceiling windows, rain shower and large balcony. Features a King bed, ocean view, floor-to-ceiling windows, rain shower and a furnished balcony. Features two Queen beds, swim-up pool, floor-to-ceiling windows, rain shower and large balcony. Features 2 Queen beds, garden view, floor-to-ceiling windows, bathroom with rain shower and a balcony with small plunge pool. Features 1 King bed, garden view, floor-to-ceiling windows, rain shower and balcony with small plunge pool. Features two Queen beds, ocean views, floor-to-ceiling windows, rain shower and a furnished balcony. Features 1 King bed, stunning ocean front location, large balcony, rain shower and floor-to-ceiling windows. Features 2 Queen beds, ocean front location, large balcony, rain shower and floor-to-ceiling windows. Features 1 King bed, ocean views, access to the lounge, large balcony, rain shower and floor-to-ceiling windows. Features a King bed, stunning ocean front location, large balcony, rain shower, floor-to-ceiling windows. Features a King bed, access to lounge, floor-to-ceiling windows, rain shower and large balcony. Features two Queen beds, stunning ocean front location, large balcony, rain shower, floor-to-ceiling windows. Features a King bed, ocean views, access to lounge, large balcony, rain shower and floor-to-ceiling windows. Features 2 Queen beds, access to the lounge, floor-to-ceiling windows, rain shower and a large balcony. Suite with 1 King bed, ocean front views, furnished balcony, rain shower and floor-to-ceiling windows. Features two Queens, access to the lounge, floor-to-ceiling windows, rain shower and large balcony. Features 1 King bed, ocean front location, private plunge pool, rain shower and floor-to-ceiling windows. Features a King bed, ocean front location, access to lounge, rain shower, floor-to-ceiling windows. Features a King bed, ocean front location, furnished balcony, rain shower, floor-to-ceiling windows. Features a King bed, ocean front location, furnished balcony, rain shower and floor-to-ceiling windows.